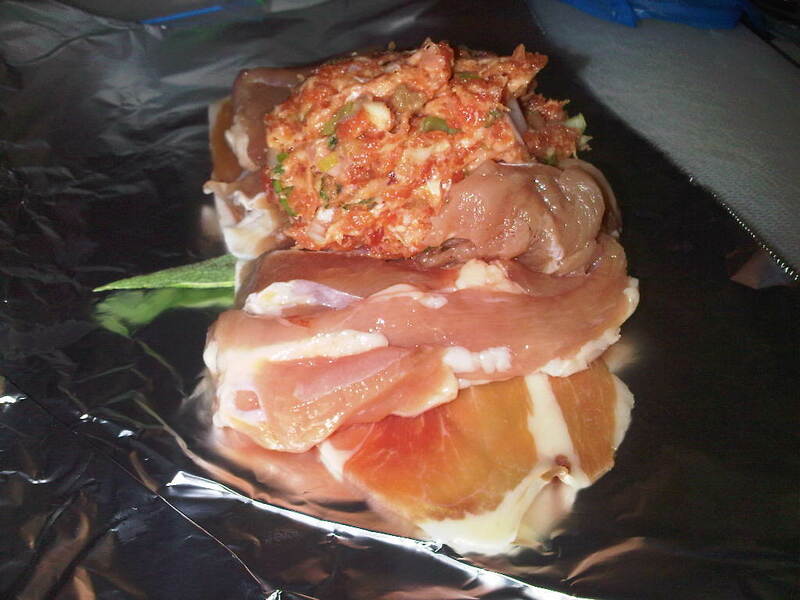 M(i)s Ch(i)ef™: Festive Stuffed Chicken Thigh - Easy Christmas Dinner! Festive Stuffed Chicken Thigh - Easy Christmas Dinner! I like to have my Christmas Cake and eat it too! What I really mean is that I don't like to limit my Christmas spread just to Turkey or Ham or Prawns or..... The trouble with cooking for so many people and wanting such a variety is the oven space. Inspired by Christmas recipes of stuffed, rolled birds, I designed an easy festive stuffed Chicken Thigh that we're going to serve as part of a banquet for the family on Christmas Day. The thigh is much more moist than the breast, which is why I chose that part of the chook, and is a small enough to be individual and big enough to roll and with some tasty stuffing inside! We also cooked it on the BBQ meaning that the precious oven space will be freed up for bigger (not necessarily better) things! BBQ turning often until the roll is cooked through. Add a dash or red wine to the flour and stir to make a paste. Add the flour to the sauce to thicken it and make it glossy. Yum! Will definitely give this a try - looks amazing! Hi Michelle - many thanks for asking. Yes! please feel free use the picture. Hi Michelle! As always your dishes look superb. I'd like to wish you and your family a most wonderful and magical Christmas!